The San Mateo County Forensic Laboratory and Coroner's Office project involved the construction of 28,500 square feet of laboratory, office and associated support buildings. 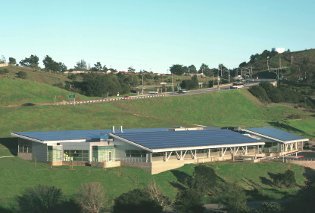 This $17 million project is a one-story facility on a sloping site, oriented to maximize solar exposure for maximum benefit of the rooftop photovoltaic (PV) system, and to minimize excavation of the hillside. Crosby Group provided an economical structural steel framing solution to meet the owner's needs. All of the structural steel was exposed and finished using AESS construction standards for attractive appearance and durability. The exposed steel also added to the open and airy feel of the interior space. The building system design helps integrate various energy and recycled material efficiency features and reflects a commitment to sustainable design. This project is LEED certified by the US Green Building Council and was selected by the American Institute of Architects as one of the top 10 Green Projects of 2003. It also was the recipient of the 2006 Award of Honor from the Savings by Design Energy Efficiency Integration Awards. Copyright © The Crosby Group. All Rights Reserved.